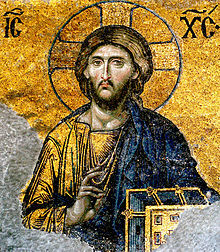 The word Pantocrator is of Greek origin meaning “ruler of all”. Christ Pantocrator is an icon of Christ represented full or half-length and full-faced. He holds the book of the Gospels in his left hand and blesses with his right hand. It is the tradition of the Church to depict “God is with us” by having the large Pantocrator icon inside of the central dome, or ceiling of the church.